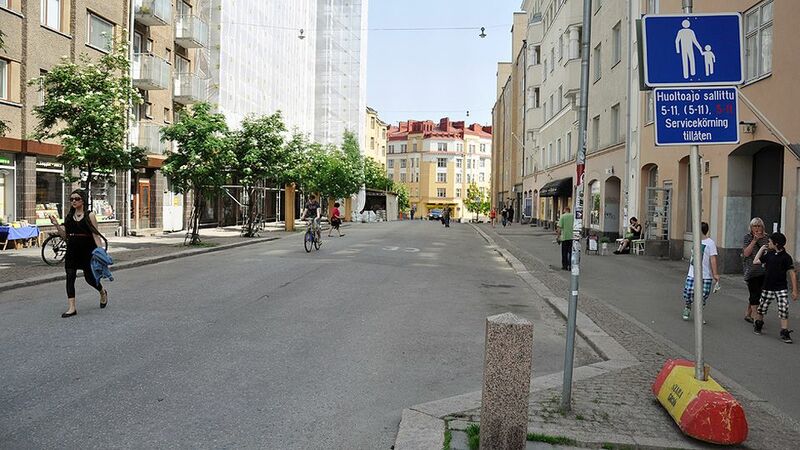 In the beginning of this year, Helsinki’s City Planning Department decided to transform Vaasankatu, a 0.5km-long street in the wider neighborhood of Kallio to a pedestrian street from the beginning of June until the end of September. This decision was preceded by discussions on introducing more pedestrianized streets in the inner city to increase “vibrancy” in central Helsinki. At first the project was turned down due to the investment costs of transforming the car lanes into pedestrian-friendly space. But proponents of the initiative suggested that the concept could be tried by simply just blocking car access to the street. And the project took off. In the next phase, the experiences gained this summer from a pedestrianized Vaasankatu will be evaluated as the basis for future decision-making about going all the way with the idea. So what has happened? Has Vaasankatu become a synonym for urban buzz like its Nordic idols such as Drottninggatan in Stockholm or Strøget in Copenhagen? The answer is no, it most certainly has not. What has happened is that Vaasankatu has become a street where cars have vanished. Pedestrians stick to the sidewalks just like they did before, and essentially the only thing that separates the street from how it was before is the empty space that was previously street-side parking space and two lanes for driving along the street. The future does not seem bright for the pedestrianization of Vaasankatu. The hustle and bustle on Vaasankatu during a summer weekend. Photo courtesy of Yle. And the way things are going, it would be a mistake to do so anyways. The core problem is in the conceptualization of the pedestrian street. Besides the people-instead-of-cars ideas that are in good currency at the moment, the city of Helsinki has recently found an active interest in supporting “spontaneous activities” for enlivening the city. Consequently Helsinki is now home to many fantastic initiatives such as the “Restaurant Day” and “Cleaning Day” which make the city’s urban culture richer. Somehow these ideas however also got mixed up into the conceptualization of a pedestrian Vaasankatu. The planning department states that the primary object of the project is that “the removal of cars enables the street to be used for different events and new kinds of activities”. The problem just is that this is not what pedestrian streets – or streets more broadly – are solely about. They are not blank canvases of space between buildings that can stage temporary activities and events. They are also important places of commercial encounter, a linear interpretation of the marketplace. And they thrive in places that people move through. In other words, pedestrian streets do not create pedestrians out of nowhere. These aspects have been largely forgotten in the pedestrianization of Vaasankatu. Vaasankatu is not by definition a street between destinations, although it does have some potential. The other end is home to the Sörnäinen subway station, which acts as a hub for movement. But the other end does not clearly lead anywhere specific that would attract people to walk through Vaasankatu. Furthermore, the street is neither an important shopping street in the neighborhood. It is a street best known for its many bars. If I were in charge and had to test the potential of Vaasankatu as a pedestrian street, I would let the bars expand their terraces and strengthen the role of the street as a hotspot for the neighborhood’s bar and restaurant scene. This would enable the street to be place where people come to spend time. A destination in its own right. Spontaneous activities would be welcome too, but they would not be the raison d’ètre for the pedestrian street. Life along Copenhagen’s Strøget. 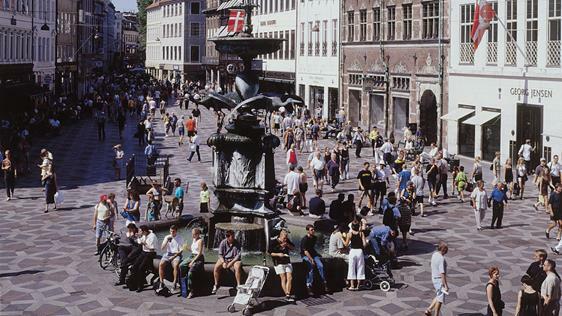 Photo courtesy of visitcopenhagen.com. But more broadly, I would be careful about getting too excited about pedestrianization altogether. Great streets can also accommodate cars, cyclists and pedestrians all at once. All modes of transport belong in the city. The pre-pedestrianized Vaasankatu was a street with wide sidewalks, normal street-side parking and calm traffic; the prototype of an ideal street many contemporary planners around the world strive to create. This, I hope, is a priority also in Helsinki. Clear opinion Timo! And yes, expand terrasses… the most simple solution of all? How come the bars did not take initiative to do this themselves?? Congrats with finalizing your study! Any idea when you will be in Brussels??? And thanks! It feels incredibly nice not to have to study anymore 🙂 My thesis defense is on Friday 27th September and graduation ceremony/dinner on the 28th. I arrive to Brussels on the 26th and leave in the morning of 29th (to Greece ;)). Some excellent observations. Indeed it takes more than excluding traffic to pedestrianise a street. I almost wonder whether this example was set up to fail to demonstrate that pedestrianisation has negative effects. Congratulations on your graduation! Would be nice to know more about this framework..
We are having a similar ‘project’ in Minsk, Belarus. Soon the Ice-hockey championship is going to take place there. And the city closes down of the central streets every weekend. Many people are very excited about it. It looks more empty now than a European walking street – the density of bars and shops is very low there. But they put up tables where people sell handmade stuff, souvenirs, art schools have their performances there, artists sell there pictures. It’s a good start. It is very difficult to make a street or part of it a ‘destination’ in its own right. It must be able to lead to somewhere else where people might like to go. The other challenging aspect is that everyone expects instant results. It must be accepted that it will probably take some time for the momentum to develop. Congratulations to have found one of mankinds big problems! You can see it everywhere – decisions taken from some clerk´s desk without any real insight about the psycology and perception of human beings….